Too much sunlight or even the slightest drizzle can ruin your hair, outfit and shoes effectively spoiling an overall look. Thank goodness for fashion umbrellas to give coverage when needed without messing up styles. Gone are the days when you dread being seen carrying a plain, drab stick. You’ll love every colour and design that umbrellas come these days with automatic or hook closures. There are plain umbrellas or fabulous motif such as animal print, polka dots, flowers, geometric designs, and even maps. Size has also been adapted to fit every person’s needs from a stick, collapsible, flat to travel size. Even umbrellas are now wind proof depending on the shape from a flat to a bubble canopy. There are also resistant frames that won’t buckle easily against gale force winds or closures that are easy to handle when it’s time to put it away. It's easy to be elegant even when it's raining or there's too much sun. Take Ferre's Diamante Anthracite Designer Walking Length Umbrella or Jean-Paul Gaultier’s art deco creations. Lulu has a fascinating lip blot design folding umbrella while Romanelli created a UV coated umbrella. You can even have art design umbrellas with prints from Monet, Degas, and Van Gogh. 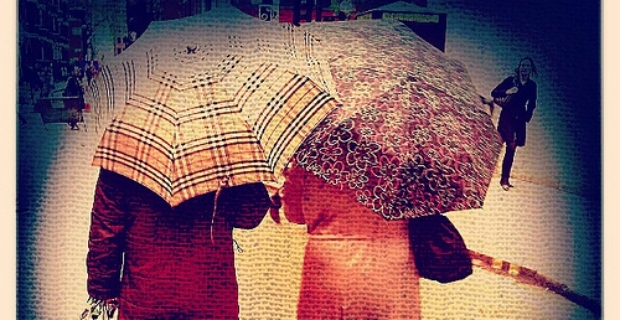 Even celebrities are seen with fashion umbrellas for protection, as shield from paparazzis or as a fashion accessory. Remember, Johnny Depp on the set of “Rum Diary” or Uma Thurman with an assistant following her with a white umbrella? Who says you can’t look every inch glamorous when it's raining when you have an umbrella holder like Mariah Carey spotted on the set of American Idol with a grey and white stick? What about Julia Roberts seen in a fun plaid umbrella while filming a movie or patriotic UK TV host Fearne Cotton with a Union Jack cover? Even the Queen of England was seen with a bespoke Fulton crimson, transparent bubble umbrella on her way to St. Paul’s Church. From big stars such as Beyonce to celebrity kids like Suri Cruise, fashion umbrellas are to here stay.